Yes, yes, and yes! Give LOTS of book talks, make sure kids have their “to read next” list, and dedicate consistent time for kids to read in class. I’ve seen a remarkable difference in the amount of books circulating around the room and between readers. Our kids give book talks, as well: http://scholarsrm239.weebly.com/book-talks–read-alouds and then watch each other (from the other classes) to get more recommendations! Enjoy this new part of your journey – you won’t look back! Thanks, Joy, will do (Kittle has great advice in the book on book talks). Thanks for the resource as well. Kudos to you! I have been doing SSR for many years in my classroom. When students leave my class, it’s the one thing they say they miss. I love seeing the kids who “hate” to read, read a book all the way through. 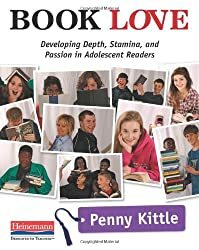 I am a huge fan of Penny Kittle as well and I have her books, but I will say that I don’t conference with the students. To me it seems like it’s a disruption to the class (I can’t whisper!). However, I will start using the reading log tomorrow. I have done projects and such, but I want a better way to see that they are reading. My goal is to not make it feel like work or a book report. Movie trailers have been pretty successful too. I make the kids do book talks and yes, some of them still don’t read the book in it’s entirety. I was at NCTE and ALAN this year and shipped home well over 100 books for my classroom library. Did you grab any books from the exhibit hall? That is definitely one way to get more books. I would love to keep this conversation going. I hope that you post about your experience and any ideas you have about projects for them to do. I would love to see them. Thanks for sharing! Thanks, Keia. I did get some freebies and cheapies in the exhibit hall. I will continue to post as I figure out how to make this work in my classroom. Hello! As a graduate student in a teacher education program, I am excited to read about what successful English teachers are out there doing. I have been thinking often about how to get students to enjoy reading, because as you mentioned, the numbers of students who do not enjoy reading is quite alarming. Especially with all of the resources available on the internet these days, students can just look up a book without ever reading it. I have seen SSR in many of the classes where I am doing my student teaching, and it seems to be working in building that reading culture that fosters reading for enjoyment. I am very interested in reading about how this works in your classroom! I also love the idea of a library for students, something that I wish I had when I was in high school. I also think that your comments on the importance of reading books, not specific books, are apt. Our teaching should be based on skills, not on the literary canon, in my opinion! Thank you for sharing your knowledge and I look forward to checking in to see how it is all developing in your classroom. Thanks, Willow. I plan to keep posting about how it’s going for me.